This article needs to be updated with material from Historical Turning Points: Antallos, First Succession War (Source Book). Once this title clears the Moratorium period, or if it already has, please consider revisiting this article and updating it with the new material, removing this tag once all information has been added. The Antallos system is the location of at least one inhabited world, Antallos III - also referred to as Port Krin - and as at 3145 was an independent world within the Periphery. The Antallos system is located in the Periphery near the Enif and Greypearl systems and has a K4IV-class primary star. The Antallos system was settled in 2764 as a joint venture by companies from the Draconis Combine, Federated Suns, Outworlds Alliance and Terran Hegemony, with the intention that the system would serve as a Star League trading post. Antallos III is the third planet in the Antallos system, and is an arid world with two moons. Following the collapse of the Star League civilization on Antallos collapsed quickly, and by the thirty-first century the barren wastes ("Free Zones") of Antallos were home to the worst of humanity. The chemically and biologically-tainted Free Zones were home to roving gangs and itinerant pirate bands. The economy of Antallos, such as it is, ran off of (mainly illegal) free trade. Antallos was originally planned as a Star League trading outpost. It was to be a neutral planet where anyone can come to do business. The bold experiment was a huge success in the era of the Star League. Wealthy patrons, eager to establish their own fortunes on the otherwise barren frontier world, created successful enclaves that drew in billions and eventually caused the Star League to plant their own bases on the planet in the interest of security. 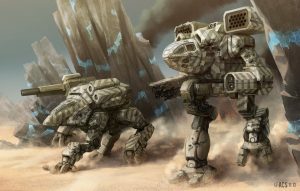 When the Succession Wars broke out, the Draconis Combine (among others) ravaged the planet for its lostech, eventually massacring half the population. This catastrophe resulted in the collapse of civilization, and Antallos's city-states started fighting amongst themselves. Combatants deployed weapons of every type except atomic and nuclear. As technology and resources dwindled, the intensity and barbarism of these wars have remained unchecked. During the mid-3050s, the planet was adopted by the rogue mercenary unit Vinson's Vigilantes, which attempted to be the planet's guardians while trying to get work. Also during this time, Pirate King, Vance Rezak and the Band of the Damned established their own estates on the outskirts of the city-states. The two powerful factions clashed with each other over the course of years, until 3065. Where the Vigilantes command collapsed following a failed assault on the Band, before the survivors then joined the Band peacefully. The Damned becomes a powerful faction on the planet. Antallos was a harsh world by the thirty-first century. In the northern hemisphere, the Sea of Despair was a vast lifeless desert surrounded by the few city-states which managed to trade across it. To the south were the Shattered Wastes, a badlands region thousands of kilometers long that held the distinction of being one of the roughest areas in the Periphery. The planet’s most vicious native predators lived here among the hidden oases that held small communities. Scattered around the world were just over thirty generally dome-enclosed city-states which provided a semblance of order for the majority of the world's population. As there was no central government, these city-states were independent, providing only their residents with security against the Zone Gangs that drifted through the Free Zones. City-states often financed their existence through slavery and narcotics trafficking as well as other more serious activities. The defense of each city-state was provided by armies of slaves. Antallos was also home to outlaws aligned with every major organized crime syndicate within the Inner Sphere, pirates and renegades (including Vinson's Vigilantes), outcasts, prospectors, adventurers and political extremists (including Citizens for Davion Puirty). The largest and wealthiest city on the planet during the thirty-first century was Port Krin. There were no formal mercenary hiring halls or anything even resembling a hiring hall on Antallos. Since most of the mercenaries coming to this world were down-on-their-luck or wanted men, and hiring halls were impractical. Many of the mercenary groups had a price on their head, yet they made themselves available to hire in the hopes of finding a way out of their predicament and finding a small amount of legitimacy. Most of the deals that were brokered through this planet were those types that no normal mercenary group would take. Contracts were sometimes signed as a result of trickery or force, and even included pirates as employers. Clan Snow Raven’s invasion of Antallos and occupation completely disrupted all mercenary operations on the planet. Antallos is a hot, dry, and mostly barren world. Almost ninety percent of the planet is land, most of which is either featureless deserts or rugged badlands, referred to as "Free Zones". Most of these Free Zones were rendered uninhabitable during the Succession Wars by hostile native wildlife and the residue from biological and chemical warfare. The planet has five large seas and lakes, two small polar caps, and thick untamed jungle that dominates the equatorial regions. Port Krin: the largest and wealthiest city-state on Antallos, located on the eastern shores of TaliSea. ↑ 4.0 4.1 4.2 4.3 4.4 4.5 4.6 4.7 4.8 4.9 Mercenaies Supplemental II, p. 12, "Mercenary's Atlas"
↑ Field Manual: Updates p. 199, "Pirates" - Band of the Damned - Band of the Damned absorbs rogue Vigilantes unit and become powerful faction on planet in 3065. ↑ Field Report: Draconis Combine, p. 21, "Draconis Combine Mustered Soldiery Deployment Map - [August 3079]"
↑ Field Manual: SLDF, p. 214, "Independent Regiments"
↑ Mercenaries Supplemental, p. 70, "Mercenary Employment Table"